At 7:07 AM on Saturday 14th of March I jumped on a train from Manchester Piccadilly to Birmingham New Street with @Mr_Neil_Turner, @Linds_Bennett and @RichardDeakin for our third La Salle Education conference. After another manic week at school, it was definitely worth the trip. Each and every time Mark McCourt delivers a conference of the highest of quality, with useful workshops and at the same time he successfully gathers some of the most wonderful teachers up and down the country. This is my account of the day. I have seen David deliver a workshop at each La Salle conference and without fail he presents a different workshop each time and every time. 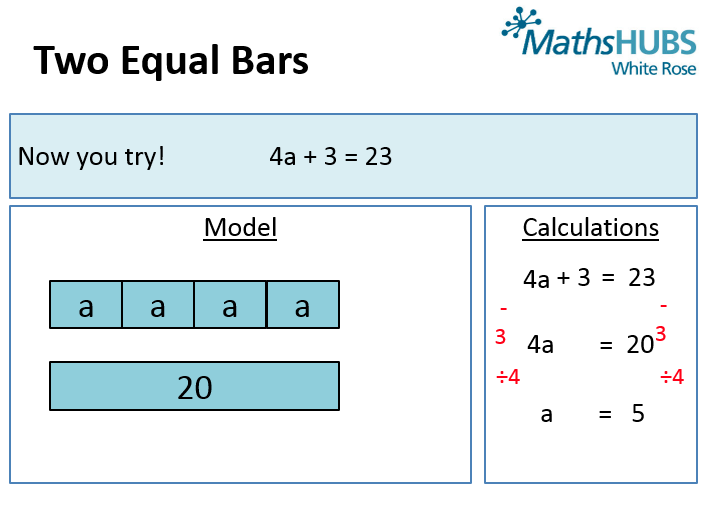 I always walk away with a better understanding on assessment, a clearer insight behind the philosophy of Mathematics Mastery, and this time David discussed the use of effective bar modelling, the use of algebra tiles and the double number line. I have seen different workshops on bar modelling, but David’s interpretation was very interesting. 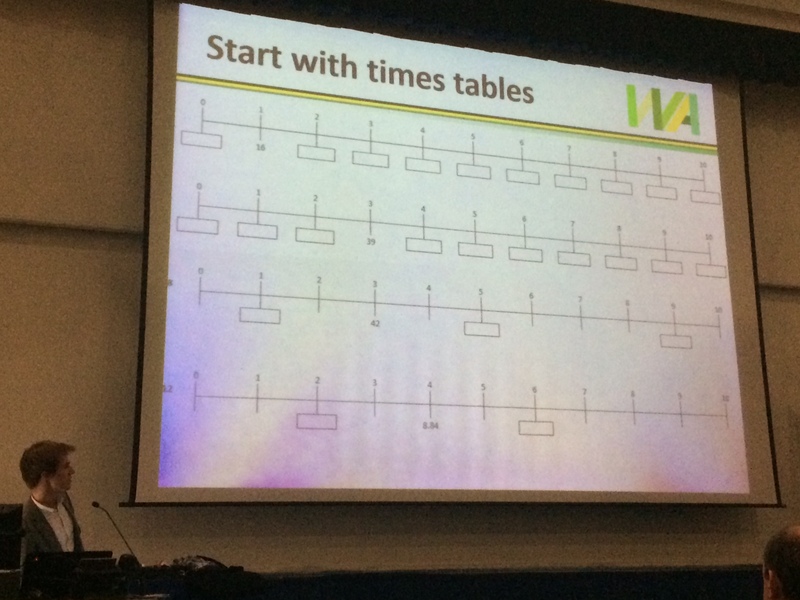 I have seen bar modelling examples where the variables are all represented as different bars but in this case David promoted the use of a single bar. I am still to get my head around using a single bar for a selection of different variables but I am leaning more towards having each bar in a column representing one variable. I hope to pick his mind soon. Furthermore, his introduction of the double number line to introduce the topic of proportion was fantastic. What a simple yet very brilliant manipulative to use. You are simply building upon the times tables! He discussed how you can scaffold the use of the double number and then transition to more challenging mathematics by introducing the concept of recurring decimals. This something I am keen on trying in the classroom very soon. Thank you David! I had the coincidental pleasure of sitting next to Rob Wilne on a train journey to London a week before the conference. After a long chat on the train I was definitely set on seeing his workshop. Rob (@NCETMsecondary) who is the Director for Secondary at NCETM discussed his findings whilst visiting a selection of schools in Shanghai (Mark reiterates – Shanghai is not a country!) Rob discussed that reasoning is composed of three essential components – factual knowledge, procedural fluency and conceptual understanding. 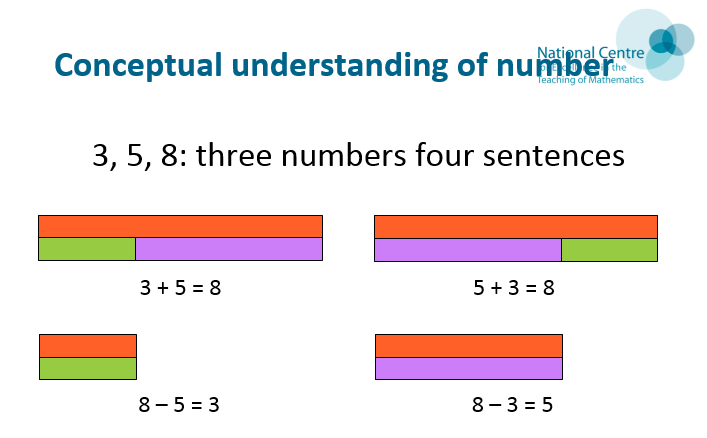 He then went onto explaining and analysing a selection of examples on how to develop conceptual understanding of number through the use of concrete-pictorial-abstract (CPA) manipulatives such as bar modelling to generate number sentences. The value of using CPA manipulatives is to develop student’s conceptual understanding of number, and then he moved onto showing examples of students reaching a stage of procedural fluency where they start reasoning about number because of a deeper understanding of number. The very important difference between the two ideas struck me. The deeper understanding of number serves the purpose of enabling students to reason using the CPA manipulatives shown. 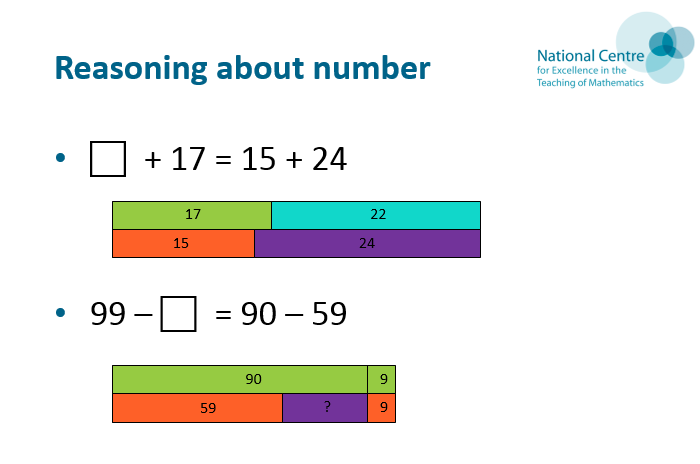 Whereas the skill of reasoning about number is strongly linked with procedural fluency. He then explained that some manipulatives (in this case Farmers’ Fields) is “good for the development of conceptual understanding, less so for procedural fluency: pupils must be supported to develop the standard algorithm from this.” Time is required on developing conceptual understanding using a concrete and then pictorial manipulative before moving onto the abstract. 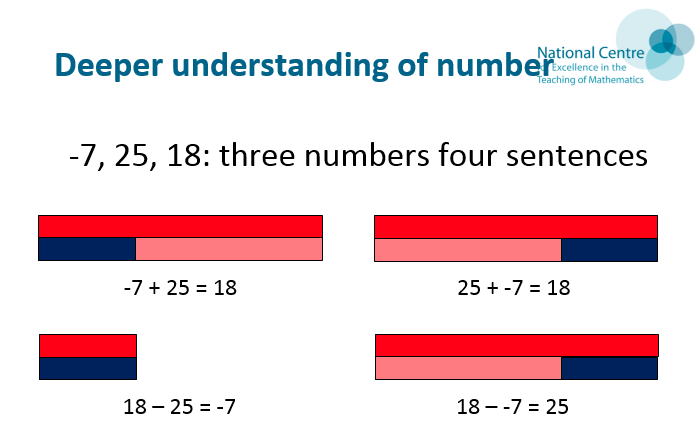 Rob emphasised that pupils require “years of experience and familiarity with a mathematical concept before they can reason with confidence and creativity in the domain around that content.” From a solid foundation of factual knowledge, and then a strong development of conceptual understanding of number are then students able to effectively reason about number and develop that procedural fluency that challenging problem solving tasks demand of our pupils. 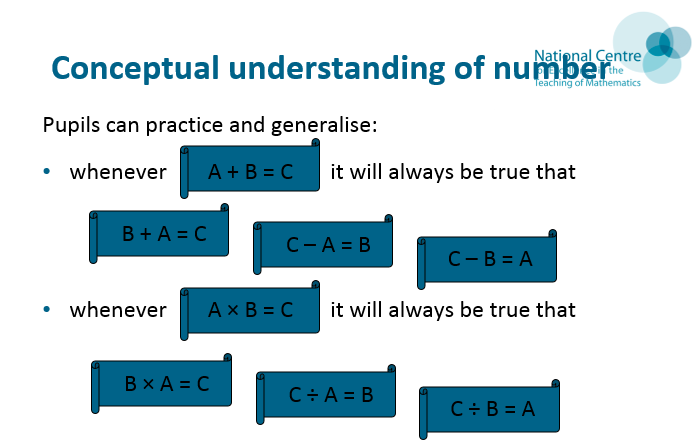 Pupils must understand the structure of the manipulative used and identify the standard algorithm from it. 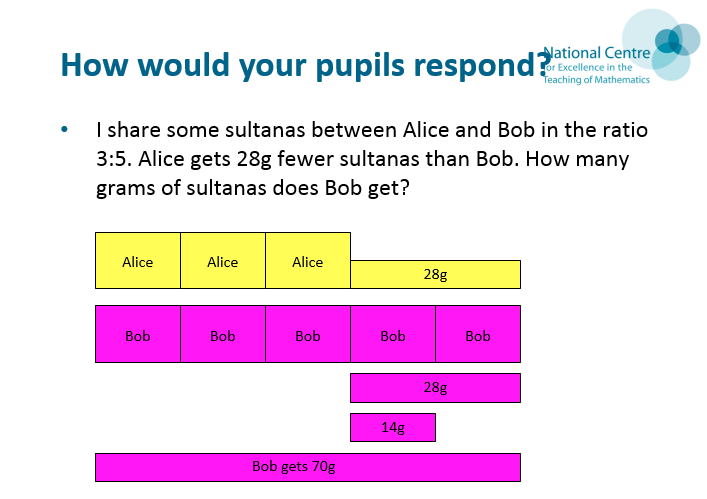 For example, “I share some sultanas between Alice and Bob in the ratio 3:5. Alice gets fewer sultanas than Bob. How many grams of sultanas does Bob get?” In this example, Rob emphasised the importance of bar modelling to draw students’ attention to the additive structure of the problem where the difference in amount is highlighted by Alice’s bar being smaller than Bob’s by two equal sized boxes. 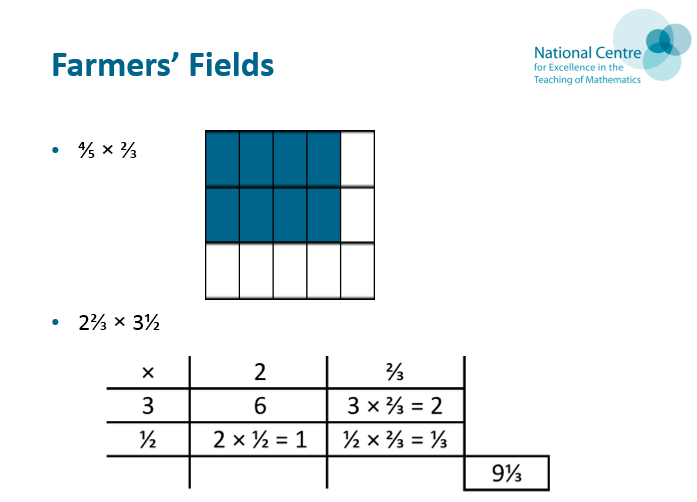 Then it is crucial to spend time on enabling students to acquire deep conceptual understanding of the multiplicative structure of the problem in regards to the ratio element of it. 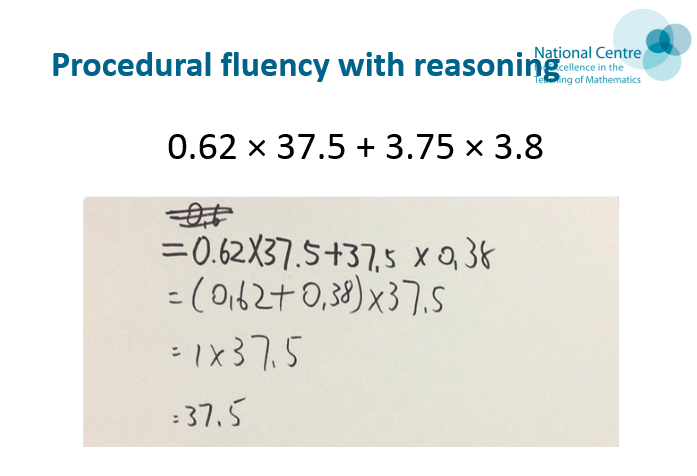 From a deep understanding on using such concrete and pictorial manipulatives students are developing that conceptual understanding, but procedural fluency requires pupils’ to manipulate problems of increasing complexity with confidence. As a teacher who is intrigued and fascinated by curriculum design and pedagogy it just fuelled me with 1001 ideas. Thank you Rob! In my opinion, this was my favourite workshop of the day. Sue Lowndes of Oxford University Press outlined how to effectively teach and plan using bar models to ensure effective student learning. 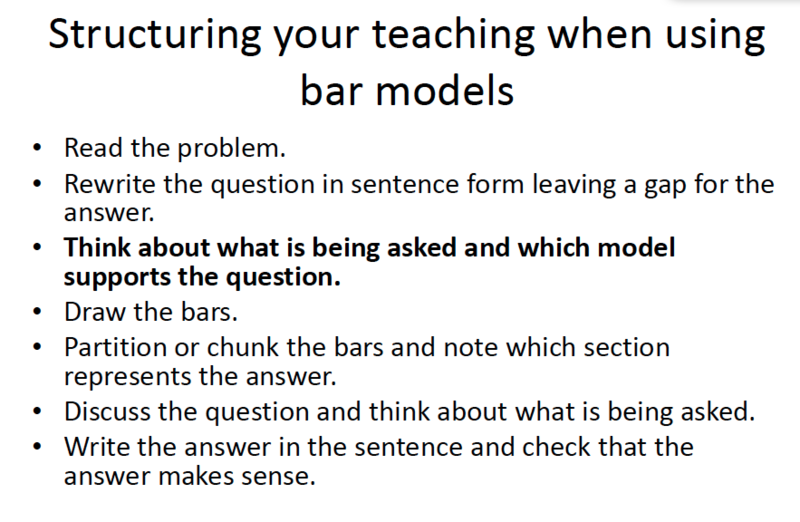 Firstly, Sue explained the importance of the key steps students need to take when learning using bar models as the main pictorial manipulative. The key point which I haven’t heard before, and which stuck with me was in highlighting where the solution of the problem lied within the bar model using a curly bracket and a question mark. How obvious but something I completely did not think of! Yet it is essential because it narrows students’ focus on identifying where the solution of the problem lies. 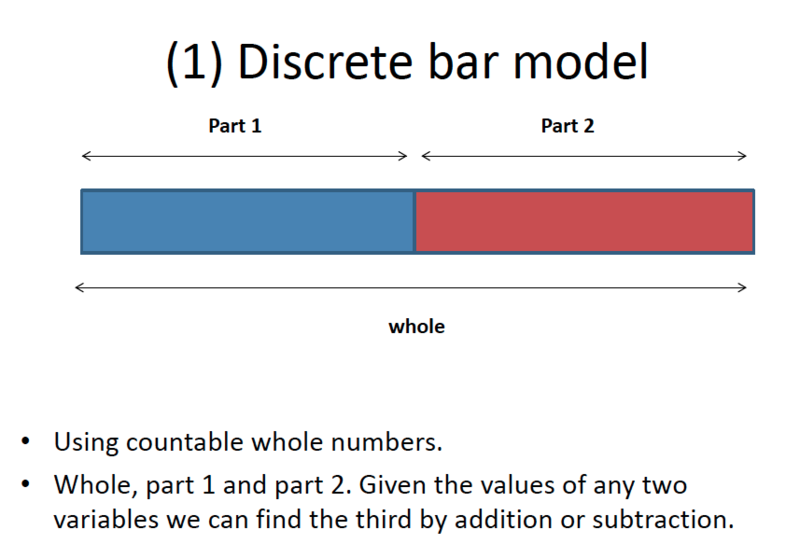 She then outlined the different types of bar models and explained the key features behind each one: (1) Discrete bar models (2) Comparison bar models for addition and subtraction. 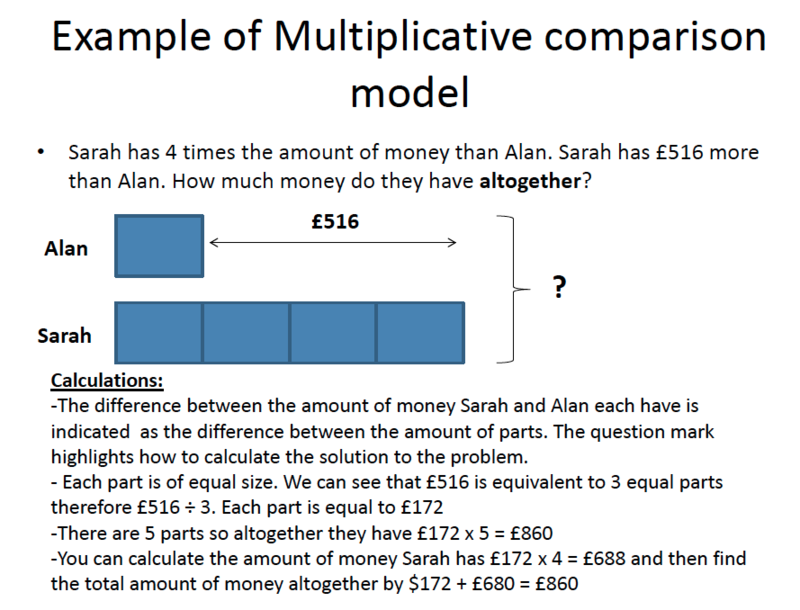 (3) Multiplicative comparison models (4) Ratio models Sue then allowed all of us excited teachers to put pen to paper and attempt a variety of our own which proved to be rather challenging in the sense of following the instructions provided at the start. It requires a great deal of thought in terms of structuring how to determine the solution using the bar model, and then using the correct bar model for the problem given. 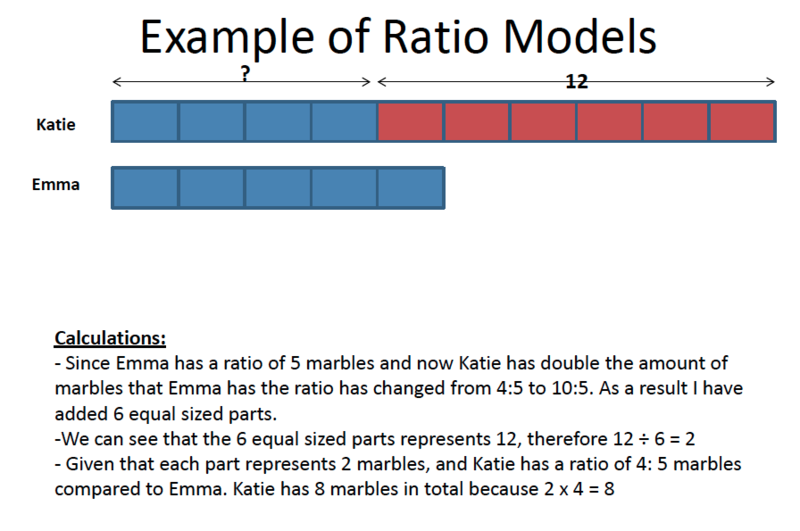 She then showed us some classwork from a selection of students on using bar models to solve simultaneous equations. I am teaching that topic very soon and cannot wait to plan the unit using bar models. 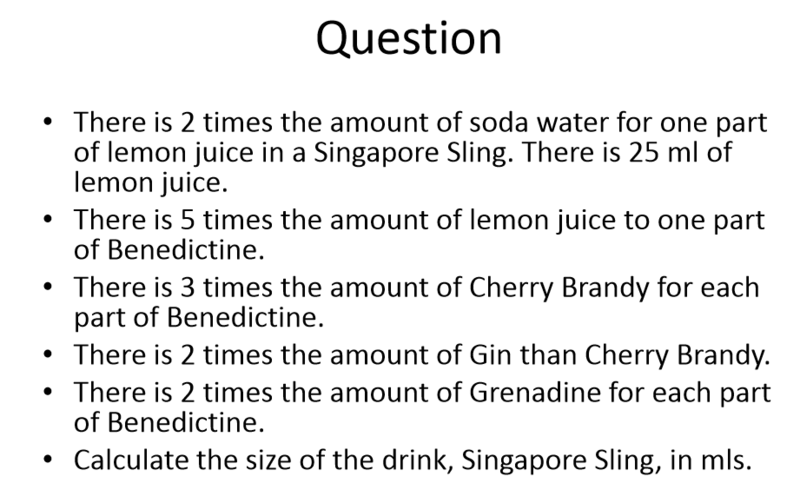 Now it is your turn to try a question that Sue asked us keen teachers to try? I shall reveal the answer next week. Overall, the conference was definitely the best that I had attended. This was not only due to the excellent workshops delivered by a selection of wonderful individuals, but also through the sheer organised manner of the event by Mark McCourt’s team. We were all in the great hall for the start of pi day. Not to mention the excellent cake and the great company. Yes, I did eat my body weight in cake that day. Next one is in Manchester, if you remember hearing a loud “YES!” during Mark’s announcement that was me. I hope to see you all at the next one. and it was finally lovely to meet Caroline Hamilton, and see again, Dani Quinn and Paul Rowlandson.